A screenshot of Linux Mint running the Xfce desktop environment, Mozilla Firefox browsing WorldHeritage, a calculator program, the built in calendar, Vim, GIMP, and the VLC media player, all of which are open-source software. Open-source software (OSS) is computer software with its source code made available with a license in which the copyright holder provides the rights to study, change, and distribute the software to anyone and for any purpose. Open-source software may be developed in a collaborative public manner. Open-source software is the most prominent example of open-source development and often compared to (technically defined) user-generated content or (legally defined) open-content movements. The open-source model, or collaborative competition development from multiple independent sources, generates an increasingly diverse scope of design perspective than one company development alone can sustain long term. And a report by the Standish Group (from 2008) states that adoption of open-source software models has resulted in savings of about $60 billion per year to consumers. Netscape's act prompted Raymond and others to look into how to bring the Free Software Foundation's free software ideas and perceived benefits to the commercial software industry. They concluded that FSF's social activism was not appealing to companies like Netscape, and looked for a way to rebrand the free software movement to emphasize the business potential of sharing and collaborating on software source code. The new name they chose was "open source", and quickly Bruce Perens, publisher Tim O'Reilly, Linus Torvalds, and others signed on to the rebranding. The Open Source Initiative was founded in February 1998 to encourage use of the new term and evangelize open-source principles. While the Open Source Initiative sought to encourage the use of the new term and evangelize the principles it adhered to, commercial software vendors found themselves increasingly threatened by the concept of freely distributed software and universal access to an application's source code. A Microsoft executive publicly stated in 2001 that "open source is an intellectual property destroyer. I can't imagine something that could be worse than this for the software business and the intellectual-property business." This view perfectly summarizes the initial response to FOSS by some software corporations. However, while FOSS has historically played a role outside of the mainstream of private software development, companies as large as Microsoft have begun to develop official open-source presences on the Internet. IBM, Oracle, Google and State Farm are just a few of the companies with a serious public stake in today's competitive open-source market. There has been a significant shift in the corporate philosophy concerning the development of free and open-source software (FOSS). Localization—particularly in the context of local governments (who make software decisions). Casson and Ryan argue that "governments have an inherent responsibility and fiduciary duty to taxpayers" which includes the careful analysis of these factors when deciding to purchase proprietary software or implement an open-source option. The Open Source Definition, notably, presents an open-source philosophy, and further defines the terms of usage, modification and redistribution of open-source software. Software licenses grant rights to users which would otherwise be reserved by copyright law to the copyright holder. Several open-source software licenses have qualified within the boundaries of the Open Source Definition. The most prominent and popular example is the GNU General Public License (GPL), which "allows free distribution under the condition that further developments and applications are put under the same licence", thus also free. While open-source distribution presents a way to make the source code of a product publicly accessible, the open-source licenses allow the authors to fine tune such access. Many people claimed that the birth of the Internet, since 1969, started the open source movement, while others do not distinguish between open-source and free software movements. The Open Source Initiative (OSI) was formed in February 1998 by Eric S. Raymond and Bruce Perens. With at least 20 years of evidence from case histories of closed software development versus open development already provided by the Internet developer community, the OSI presented the "open source" case to commercial businesses, like Netscape. The OSI hoped that the usage of the label "open source", a term suggested by Peterson of the Foresight Institute at the strategy session, would eliminate ambiguity, particularly for individuals who perceive "free software" as anti-commercial. They sought to bring a higher profile to the practical benefits of freely available source code, and they wanted to bring major software businesses and other high-tech industries into open source. Perens attempted to register "open source" as a service mark for the OSI, but that attempt was impractical by trademark standards. Meanwhile, due to the presentation of Raymond's paper to the upper management at Netscape—Raymond only discovered when he read the Press Release, and was called by Netscape CEO Jim Barksdale's PA later in the day—Netscape released its Navigator source code as open source, with favorable results. 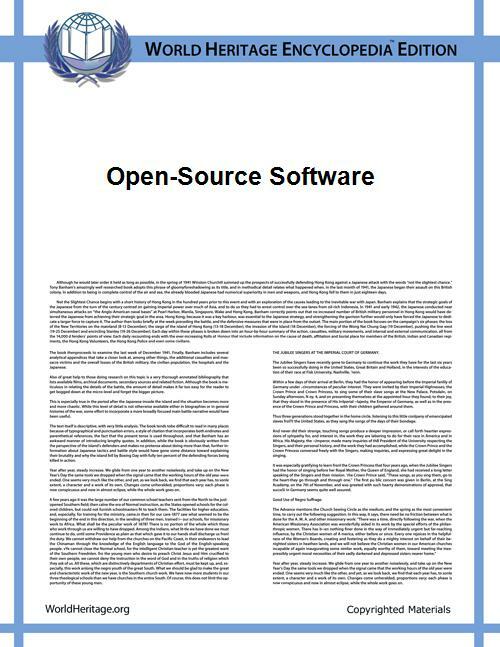 OSI uses The Open Source Definition to determine whether it considers a software license open source. The definition was based on the Debian Free Software Guidelines, written and adapted primarily by Perens. Perens did not base his writing on the "four freedoms" of Free Software from the Free Software Foundation (FSF), which were only widely available later. Under Perens' definition, open source describes a broad general type of software license that makes source code available to the general public with relaxed or non-existent copyright restrictions. The principles, as stated, say absolutely nothing about trademark or patent use and require absolutely no cooperation to ensure that any common audit or release regime applies to any derived works. It is an explicit "feature" of open source that it may put no restrictions on the use or distribution by any organization or user. It forbids this, in principle, to guarantee continued access to derived works even by the major original contributors. Despite initially accepting it, Richard Stallman of the FSF now flatly opposes the term "Open Source" being applied to what they refer to as "free software". Although it is clear that legally free software does qualify as open source, Stallman considers that the category is abusive. Critics also oppose the professed pragmatism of the Open Source Initiative, as they fear that the free software ideals of freedom and community are threatened by compromising on the FSF's idealistic standards for software freedom. The FSF considers free software to be a subset of open source software, and Richard Stallman carefully elaborated that DRM software, for example, can be developed as open source, despite that it does not give its users freedom (it restricts them), and thus doesn't qualify as free software. A license defines the rights and obligations that a licensor grants to a licensee. Open-source licenses grant licensees the right to copy, modify and redistribute source code (or content). These licenses may also impose obligations (e.g., modifications to the code that are distributed must be made available in source code form, an author attribution must be placed in a program/ documentation using that open source). Authors initially derive a right to grant a license to their work based on the legal theory that upon creation of a work the author owns the copyright in that work. What the author/licensor is granting when they grant a license to copy, modify and redistribute their work is the right to use the author's copyrights. The author still retains ownership of those copyrights, the licensee simply is allowed to use those rights, as granted in the license, so long as they maintain the obligations of the license. The author does have the option to sell/assign, versus license, their exclusive right to the copyrights to their work; whereupon the new owner/assignee controls the copyrights. The ownership of the copyright (the "rights") is separate and distinct from the ownership of the work (the "thing") – a person can own a copy of a piece of code (or a copy of a book) without the rights to copy, modify or redistribute copies of it. When an author contributes code to an open-source project (e.g., Apache.org) they do so under an explicit license (e.g., the Apache Contributor License Agreement) or an implicit license (e.g. the open-source license under which the project is already licensing code). Some open-source projects do not take contributed code under a license, but actually require (joint) assignment of the author's copyright in order to accept code contributions into the project (e.g., OpenOffice.org and its Joint Copyright Assignment agreement). Placing code (or content) in the public domain is a way of waiving an author's (or owner's) copyrights in that work. No license is granted, and none is needed, to copy, modify or redistribute a work in the public domain. The proliferation of open-source licenses is one of the few negative aspects of the open-source movement because it is often difficult to understand the legal implications of the differences between licenses. With more than 180,000 open-source projects available and its more than 1400 unique licenses, the complexity of deciding how to manage open-source usage within "closed-source" commercial enterprises have dramatically increased. Some are home-grown while others are modeled after mainstream FOSS licenses such as Berkeley Software Distribution ("BSD"), Apache, MIT-style (Massachusetts Institute of Technology), or GNU General Public License ("GPL"). In view of this, open-source practitioners are starting to use classification schemes in which FOSS licenses are grouped (typically based on the existence and obligations imposed by the copyleft provision; the strength of the copyleft provision). An important legal milestone for the open source / free software movement was passed in 2008, when the US federal appeals court ruled that free software licences definitely do set legally binding conditions on the use of copyrighted work, and they are therefore enforceable under existing copyright law. As a result, if end-users do violate the licensing conditions, their license disappears, meaning they are infringing copyright. KDE developer Aaron Seigo's presentation "How OSS Improves Society" on YouTube at the 2nd Trans-Pacific Open Source Software Conference in Honolulu, Hawaii, January 2006. Computerworld article: Does the open-source development model work for business users? Fadi P. Deek and James A. M. McHugh (2008). Open Source: Technology and Policy. Cambridge: Cambridge University Press. Chris DiBona and Sam Ockman and Mark Stone, ed. (1999). Open Sources: Voices from the Open Source Revolution. O'Reilly. Joshua Gay, ed. (2002). Free Software, Free Society: Selected Essays of Richard M. Stallman (PDF). Boston: GNU Press, Free Software Foundation. Välimäki, Mikko (2005). The Rise of Open Source Licensing: A Challenge to the Use of Intellectual Property in the Software Industry (PDF). Turre Publishing. Polley, Barry (2007-12-11). "Open Source Discussion Paper – version 1.0" (PDF). New Zealand Ministry of Justice. Retrieved 2007-12-12. ^ St. Laurent, Andrew M. (2008). Understanding Open Source and Free Software Licensing. O'Reilly Media. p. 4. ^ Verts, William T. (2008-01-13). "Open source software". ^ Rothwell, Richard (2008-08-05). "Creating wealth with free software". ^ "Standish Newsroom — Open Source" (Press release). ^ B. Charny (3 May 2001). "Microsoft Raps Open-Source Approach,". CNET News. ^ "Open Standards, Open Source Adoption in the Public Sector, and Their Relationship to Microsoft’s Market Dominance by Tony Casson, Patrick S. Ryan :: SSRN". Papers.ssrn.com. Retrieved 2015-03-30. ^ Holtgrewe, Ursula (2004). "Articulating the Speed(s) of the Internet: The Case of Open Source/Free Software.". ^ "Open Source Pioneers Meet in Historic Summit". 1998-04-14. Retrieved 2014-09-20. ^ Muffatto, Moreno (2006). Open Source: A Multidisciplinary Approach. Imperial College Press. ^ "NETSCAPE ANNOUNCES PLANS TO MAKE NEXT-GENERATION COMMUNICATOR SOURCE CODE AVAILABLE FREE ON THE NET". ^ "MOUNTAIN VIEW, Calif., April 1 /PRNewswire/ -- Netscape Communications and open source developers are celebrating the first anniversary, March 31, 1999, of the release of Netscape's browser source code to mozilla.org". ^ The Open Source Definition by Bruce Perens. January 1999. ^ "How Many Open Source Licenses Do You Need? – Slashdot". News.slashdot.org. 2009-02-16. Retrieved 2012-03-25. ^ Tiemann, Michael. "History of the OSI". Open Source Initiative. Archived from the original on May 9, 2014. Retrieved 13 May 2014. ^ Andrew T. Pham, Verint Systems Inc. and Matthew B. Weinstein and Jamie L. Ryerson. "Easy as ABC: Categorizing Open Source Licenses"; www.IPO.org. June 2010. ^ Shiels, Maggie (2008-08-14). "Legal milestone for open source". BBC News. Retrieved 2008-08-15. ^ Ghosh, R.A.; Robles, G.; Glott, R. (2002). "Free/Libre and Open Source Software: Survey and Study Part V.". Maastricht: International Institute of Infonomics. ^ a b Sharma, Srinarayan; Vijayan Sugumaran; Balaji Rajagopalan (2002). "A framework for creating hybrid-open source software communities" (PDF). Info Systems Journal 12: 7–25. ^ Landry, John; Rajiv Gupta (September 2000). "Profiting from Open Source". ^ Reynolds, Carl; Jeremy Wyatt (February 2011). "Open Source, Open Standards, and Health Care Information Systems". ^ Payne, Christian (February 2002). "On the Security of Open Source Software". Info Systems Journal 12 (1): 61–78. ^ "GNU Classpath Hacker's Guide: GNU Classpath Hacker's Guide". Gnu.org. 2003-08-11. Retrieved 2012-03-25. ^ Meffert, Klaus; Neil Rotstan (2007). "Brief summary of coding style and practice used in JGAP". Java Genetic Algorithms Package. Retrieved 2008-09-08. ^ Tripp, Andy (2007-07-16). "Classpath hackers frustrated with slow OpenJDK process". Javalobby. ^ a b c Stamelos, Ioannis; Lefteris Angelis; Apostolos Oikonomou; Georgios L. Bleris (2002). "Code Quality Analysis in Open Source Software Development" (PDF). Info Systems Journal 12: 43–60. ^ Gallivan, Michael J. (2001). "Striking a Balance Between Trust and Control in a Virtual Organization: A Content Analysis of Open Source Software Case Studies". Info Systems Journal 11 (4): 277–304. ^ Hellekson, Gunnar. "Home". Open Source for America. Retrieved 2012-03-25. ^ from EntandoSrl (Entando ). "Mil-OSS". Mil-OSS. Retrieved 2012-03-25. ^ "Stanford's Entrepreneurship Corner: Mike Olson, Cloudera – Ping Li, Accel – Opportunities Abound in the Big Data Space [Entire Talk]". stanford.edu. ^ Irina Guseva (@irina_guseva) (2009-03-26). "Bad Economy Is Good for Open Source". Cmswire.com. Retrieved 2012-03-25. ^ "Open Source vs. Proprietary Software". PCWorld Business Center. Pcworld.com. 2011-11-03. Retrieved 2012-03-25. ^ Geoff Spick (@Goffee71) (2009-10-26). "Open Source Movement Finds Friends at the White House". Cmswire.com. Retrieved 2012-03-25. ^ "Pandora's box for open source – CNET News". News.cnet.com. 2004-02-12. Retrieved 2012-03-25. ^ Murphy, David (2010-08-15). "Survey: 98 Percent of Companies Use Open-Source, 29 Percent Contribute Back". News & Opinion. PCMag.com. Retrieved 2012-03-25. ^ a b "Homeland Security helps secure open-source code – CNET News". News.cnet.com. Retrieved 2012-03-25. ^ Greenley, Neil. "Open Source Software Survey". Retrieved 9 October 2012. ^ Seltzer, Larry (2004-05-04). "Is Open-Source Really Safer?". PCMag.com. Retrieved 2012-03-25. ^ Michelle Delio. "Linux: Fewer Bugs Than Rivals". Wired.com. Retrieved 2015-03-30. ^ "Why Open Source Misses the Point of Free Software – GNU Project – Free Software Foundation". Gnu.org. Retrieved 2015-03-30. ^ "Microsoft announces expansion of Shared Source Initiative". Geekzone.co.nz. 2005-03-21. Retrieved 2015-03-30. ^ "OSI Approves Microsoft License Submissions". opensource.org. 2007-10-17. Retrieved 2013-08-08. Acting on the advice of the License Approval Chair, the OSI Board today approved the Microsoft Public License (Ms-PL) and the Microsoft Reciprocal License (Ms-RL). The decision to approve was informed by the overwhelming (though not unanimous) consensus from the open source community that these licenses satisfied the 10 criteria of the Open Source definition, and should therefore be approved. ^ Berlind, David (2006-11-21). """Are SugarCRM, Socialtext, Zimbra, Scalix and others abusing the term "open source?. ^ "The open source platform for numerical computation". ^ "SCILAB License". INRIA. Retrieved 2008-01-04. ^ "What is open source?". Retrieved July 29, 2013. ^ "Open Collaboration Bitcoin". Informs.org. 2014-01-02. Retrieved 2015-03-30. Supporters of the open content movement advocate some restrictions of use, requirements to share changes, and attribution to other authors of the work. The same principles that underlie open source software can be found in many other ventures, such as open-source hardware, WorldHeritage, and open-access publishing. Collectively, these principles are known as open source, open content, and open collaboration: "any system of innovation or production that relies on goal-oriented yet loosely coordinated participants, who interact to create a product (or service) of economic value, which they make available to contributors and non-contributors alike." There are a number of commonly recognized barriers to the adoption of open-source software by enterprises. These barriers include the perception that open-source licenses are viral, lack of formal support and training, the velocity of change, and a lack of a long-term roadmap. The majority of these barriers are risk-related. From the other side, not all proprietary projects disclose exact future plans, not all open-source licenses are equally viral and many serious OSS projects (especially operating systems) actually make money from paid support and documentation. Open source software projects are built and maintained by a network of volunteer programmers. Prime examples of open-source products are the Apache HTTP Server, the e-commerce platform osCommerce, internet browsers Mozilla Firefox and Chromium (the project where the vast majority of development of the freeware Google Chrome is done) and the full office suite LibreOffice. One of the most successful open-source products is the GNU/Linux operating system, an open-source Unix-like operating system, and its derivative Android, an operating system for mobile devices. In some fields, open source software is the norm, as in voice over IP applications with Asterisk (PBX). The Creative Commons licenses, designed mainly for media but sometimes used for software, offers license clause elements which allow licensing in the spectrum between open-source, source-available, and public domain. In 2007 Michael Tiemann, president of OSI, had criticized companies such as SugarCRM for promoting their software as "open source" when in fact it did not have an OSI-approved license. In SugarCRM's case, it was because the software is so-called "badgeware" since it specified a "badge" that must be displayed in the user interface (SugarCRM has since switched to GPLv3). Another example was Scilab prior to version 5, which called itself "the open source platform for numerical computation" but had a license that forbade commercial redistribution of modified versions. Because OSI does not have a registered trademark for the term "open source", its legal ability to prevent such usage of the term is limited, but Tiemann advocates using public opinion from OSI, customers, and community members to pressure such organizations to change their license or to use a different term. Although the OSI definition of "open source software" is widely accepted, a small number of people and organizations use the term to refer to software where the source is available for viewing, but which may not legally be modified or redistributed. Such software is more often referred to as source-available, or as shared source, a term coined by Microsoft in 2001. While in 2007 two shared source licenses were certified by the OSI, most of the shared source licenses are still source-available only. The FSF believes that knowledge of the concept of freedom is an essential requirement, insists on the use of the term free, and separates itself from the open source movement. The definition of open source software was written to be almost identical to the free software definition. There are very few cases of software that is open source software but is not free software. The difference in the terms is where they place the emphasis. "Free software" is defined in terms of giving the user freedom. This reflects the goal of the free software movement. "Open source" highlights that the source code is viewable to all; proponents of the term usually emphasize the quality of the software and how this is caused by the development models which are possible and popular among free and open source software projects. Critics  have said that the term "open source" fosters an ambiguity of a different kind such that it confuses the mere availability of the source with the freedom to use, modify, and redistribute it. Developers have used the alternative terms Free/open source Software (FOSS), or Free/Libre/open source Software (FLOSS), consequently, to describe open source software which is also free software. The main difference is that by choosing one term over the other (i.e. either "open source" or "free software") one lets others know about what one's goals are. As Richard Stallman puts it, "Open source is a development methodology; free software is a social movement." Since innovative companies no longer rely heavily on software sales, proprietary software has become less of a necessity. As such, things like open source content management system—or CMS—deployments are becoming more commonplace. In 2009, the US White House switched its CMS system from a proprietary system to Drupal open source CMS. Further, companies like Novell (who traditionally sold software the old-fashioned way) continually debate the benefits of switching to open source availability, having already switched part of the product offering to open source code. In this way, open source software provides solutions to unique or specific problems. As such, it is reported  that 98% of enterprise-level companies use open source software offerings in some capacity. Another business strategy could be adapted from existing Internet micro-payments systems including flattr and paypal. A commonly employed business strategy of commercial open-source software firms is the dual-license strategy, as demonstrated by Ingres, MySQL, eXo Platform, Alfresco, Sleepycat and others. Open Source for America is a group created to raise awareness in the U.S. Federal Government about the benefits of open source software. Their stated goals are to encourage the government's use of open source software, participation in open source software projects, and incorporation of open source community dynamics to increase government transparency. Open Source development is often performed "live and in public", using services provided for free on the Internet, such as the Launchpad and GitHub web sites. 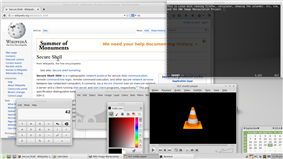 Several open source programs have become defining entries in their space, including the GIMP image editing system; Sun's Java programming language and environment; the MySQL database system; the FreeBSD Unix operating system; LibreOffice office productivity suite; and the Wireshark network packet sniffer and protocol analyser. Utilities that automate testing, compiling, and bug reporting help preserve stability and support of software projects that have numerous developers but no managers, quality controller, or technical support. Building systems that report compilation errors among different platforms include Tinderbox. Commonly used bugtrackers include Bugzilla and GNATS. Revision control systems such as Concurrent Versions System (CVS) and later Subversion (SVN) and Git, and the GNU Compiler Collection are examples of tools that help centrally manage the source code files and the changes to those files for a software project. These tools are themselves OSS. In OSS development, the participants, who are mostly volunteers, are distributed among different geographic regions, so there is need for tools to aid participants to collaborate in source code development. Often, these tools are also available as OSS. The term "open source" was originally intended to be trademarkable; however, the term was deemed too descriptive, so no trademark exists. Besides, it offers the potential for a more flexible technology and quicker innovation. It is said to be more reliable since it typically has thousands of independent programmers testing and fixing bugs of the software. It is flexible because modular systems allow programmers to build custom interfaces, or add new abilities to it and it is innovative since open source programs are the product of collaboration among a large number of different programmers. The mix of divergent perspectives, corporate objectives, and personal goals speeds up innovation. Moreover, lower costs of marketing and logistical services are needed for OSS. OSS also helps companies keep abreast of technology developments. It is a good tool to promote a company's image, including its commercial products. The OSS development approach has helped produce reliable, high quality software quickly and inexpensively. Software experts and researchers on open source software have identified several advantages and disadvantages. The main advantage for business is that open source is a good way for business to achieve greater penetration of the market. Companies that offer open source software are able to establish an industry standard and, thus, gain competitive advantage. It has also helped to build developer loyalty as developers feel empowered and have a sense of ownership of the end product. There is a need for a decision making structure, whether formal or informal, that makes strategic decisions depending on changing user requirements and other factors. Cf. Extreme programming. In the traditional model of development, which he called the cathedral model, development takes place in a centralized way. Roles are clearly defined. Roles include people dedicated to designing (the architects), people responsible for managing the project, and people responsible for implementation. Traditional software engineering follows the cathedral model. Fred P. Brooks in his book The Mythical Man-Month advocates this model. He goes further to say that in order to preserve the architectural integrity of a system, the system design should be done by as few architects as possible. Alternatively, assurance models (such as DO178B) have already solved the "certification" approach for software. This approach is tailorable and can be applied to OSS, but only if the requisite planning and execution, design, test and traceability artifacts are generated.